All of our stock containers have 4-way entry for easy use with Lift Trucks, convenient drop gate design for easy access to products, and safety rating plates with static load capacity and static load height. Custom sizes are available so please request a quote for your specific needs. 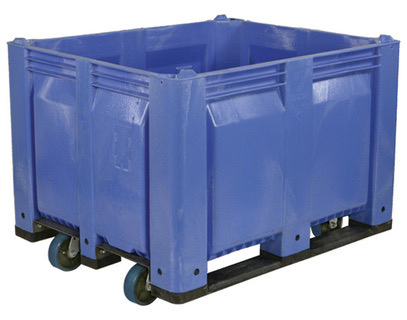 Measuring 43.5” L x 29″ W x 37″ H, these mobile bulk containers feature a lightweight steel base won’t warp or delaminate. Casters don’t break off. In wide use for scrap paper and scrap metal collection. Easy to maneuver and ships efficiently. 1 (one) Pallet Wrapz Storage Bin will hold 50 Wrapz Size 48 x 40x 42 tall. Store and quickly identify your colored pallet wrapz. Easy access with fold-down gate. Open mesh construction allows excellent ventilation. Stackable, without casters. 4-way forklift access. Contact Us for orders Large quantity orders.